I am honored to be your 80th president of the Rotary Club of Encinitas. I follow many good presidents, but especially three great women presidents who left an indelible mark on the club. I will do my best to carry on their mission of making our club one the most remarkable in the district. This club never ceases to amaze me. We have 80 years of unmatched service to the community. 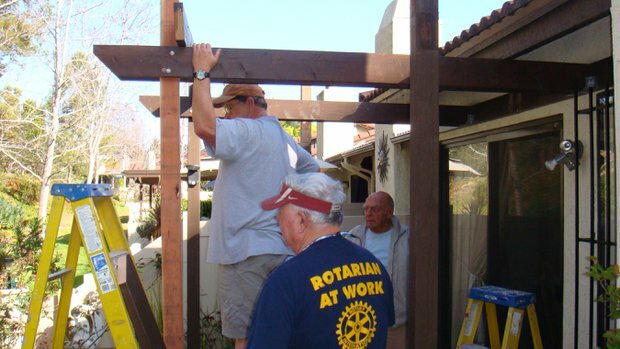 Every day, you can find an Encinitas Rotarian serving in some walk of life. 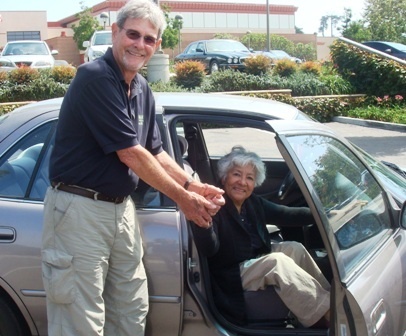 We have so many avenues of service, ranging from building houses in Mexico and schools in Viet Nam to responding to the needs of Encinitas’ senior citizens. Clearly, one of our strongest avenues of service is engaging the youth of our community. We have steadfastly worked with the other district clubs to sponsor RYLA and LEAD award-winning leadership academies, for our high school and middle school youth. The list goes on and on. 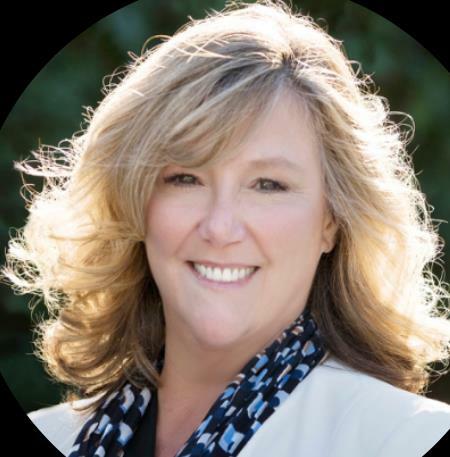 As an Encinitas Rotarian for many years, I have personally seen what all of our programs have accomplished and I will strive to continue with these efforts and to advance our common goals. Rotary is more relevant than ever. 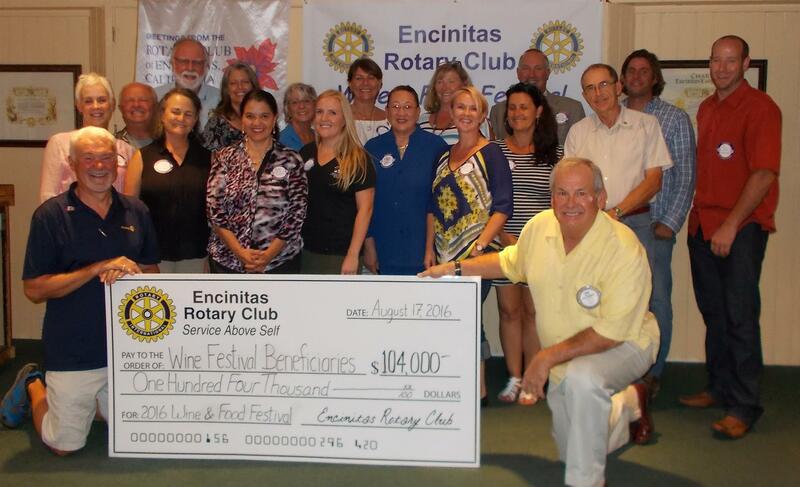 Encinitas Rotary is a microcosm of how communities and societies should work together. We all wear different hats and have different views, but there is nothing in this community, as an Encinitas Rotarian, we cannot solve together. We work every day to make this community and world a better place. This year’s Rotary International theme is “Be the Inspiration”. I look to each and every one of you to continue in our great tradition and be the inspiration! Make a Difference - Connect, Get Involved, Give Back! The City of Encinitas Senior Citizen Commission in partnership with the Encinitas Rotary Club is pleased to announce the award recipients for the 2017 “Senior Citizen of the Year Award” and “Service to Seniors Award”. This awards program is designed to identify and celebrate people who have selflessly contributed to City of Encinitas as a senior citizen role model or as someone who advocates on behalf of senior citizens. 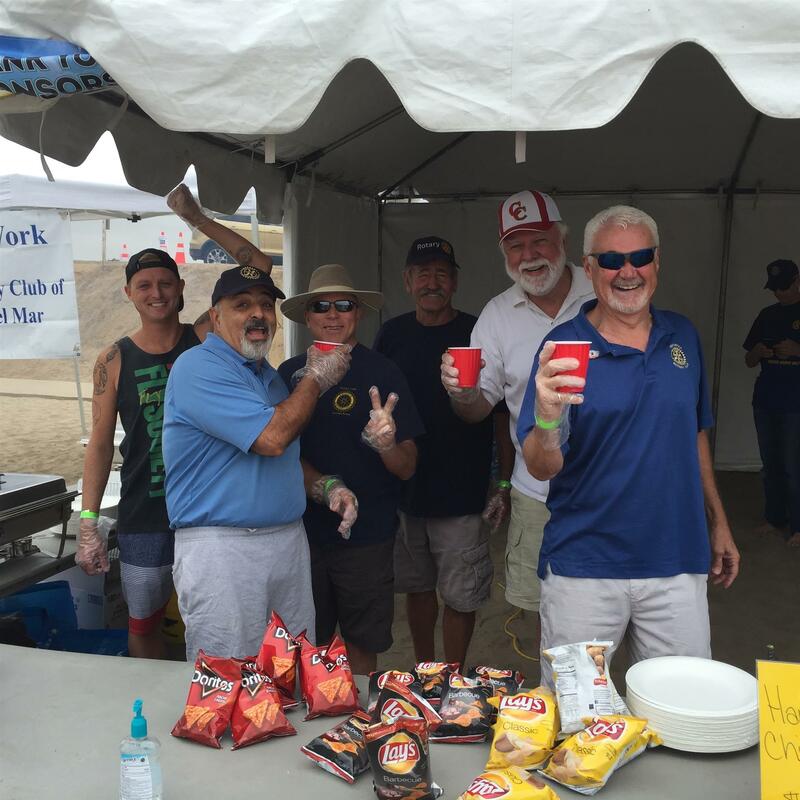 Encinitas Rotarians who volunteered at the recent Boys & Girls Club fundraiser at Dog Beach in Del Mar. The volunteers are seen enjoying one of their numerous "morale building exercises". Perhaps not surprisingly, morale stayed high during the entire event! 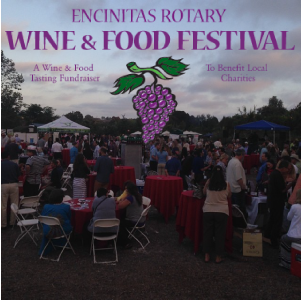 Encinitas, CA - The annual Encinitas Rotary Wine & Food Festival has become a popular mainstay event in the community. In its 13th year, the Festival supports charities, whose local or international focus is on children or the community. This year the Festival was held for the first time on the second hole of the Encinitas Ranch Golf Course. Over $104,000 was raised for the 18 participating charities. 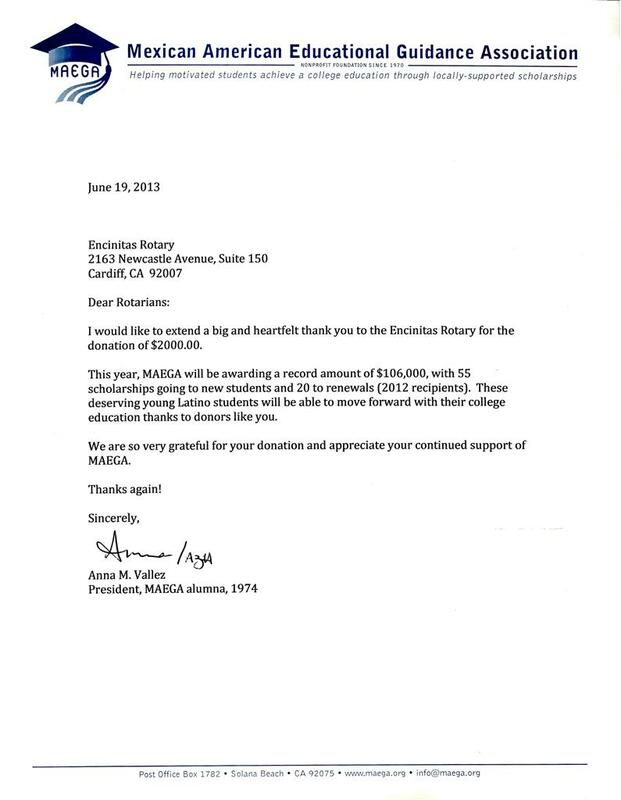 Recipients were awarded their checks at a special Encinitas Rotary Club presentation on August 17, 2016. During the ceremony, each beneficiary gave a short description of the work they do and how the funds will be used. Celebrating our Encinitas Service to Senior Award winner, Cecilia Matasko and Senior of the Year, Carolyn Cope. Thank you for all you do in our Encinitas Community. 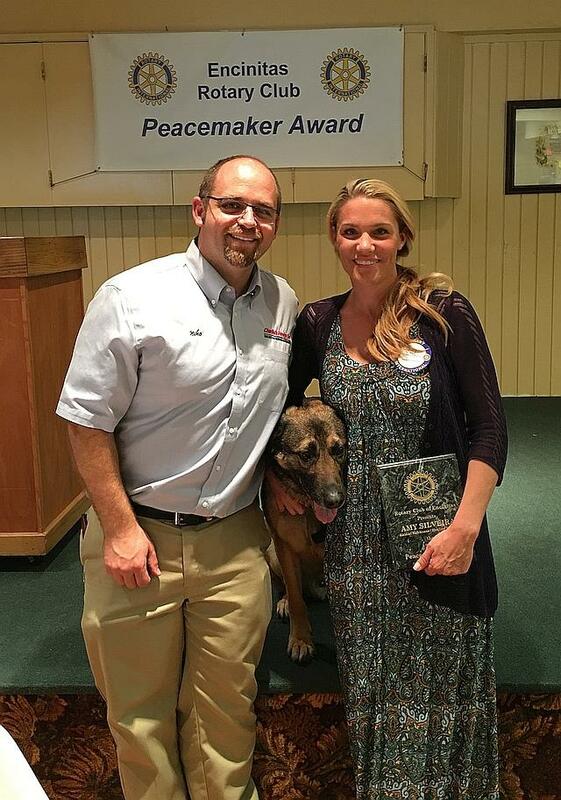 Encinitas Rotary Peacemaker Award honors Animal-Human Bond to Reduce Violence. The Encinitas Rotary Peacemaker Award honors community members who have made a significant difference in promoting tolerance, understanding, conflict resolution and peace, locally or globally. The City of Encinitas Senior Citizen Commission in partnership with the Encinitas Rotary Club is pleased to announce that they will be honoring individuals for the 2014 “Senior Citizen of the Year Award” and “Service to Seniors Award”. Both awards will be based on nominations made from the public. The “Senior Citizen of the Year Award” recipient will recognize a deserving senior citizen who embraces lifelong learning, outstanding volunteerism, leadership in the community, and/or helping, teaching, mentoring or advocating for others. The “Service to Seniors Award” will recognize a deserving citizen who through their daily work or as part of a volunteer effort has made a demonstrated impact for senior citizen(s) in the community. Both awards will be based on dedication, overarching commitment, and demonstrated impact of those served. Recipients must reside within Encinitas. Award recipients will be honored at a City Council meeting with a proclamation, and a perpetual plaque housed at the Encinitas Senior Center. Additionally, they will be recognized as the guests of honor at an Encinitas Rotary Club luncheon. Anyone may nominate an individual by completing a nomination form and returning it to the City of Encinitas, Parks and Recreation Department, 505 South Vulcan Avenue, Encinitas, CA 92024 between January 20, 2015 and February 23, 2015, or e-mailing it to cgoodsell@encinitasca.gov. Nomination forms, eligibility guidelines and additional details may be found here: Senior Citizen of the Year Award A and Service to Seniors Award. For more information regarding these awards, please contact Christie Goodsell, City of Encinitas Senior Center Manager at 760-943-2251. Mark Your Calendars for June 7, 2014! The Fabulous Wine Festival is coming!! Rich Houk and his lovely bride will be directing the upcoming Wine Festival again this year! We're looking forward to increasing the net amount that goes to Beneficiaries and our Foundation. In order to accomplish this we will look to increase the volunteer contribution from our Club members as well as beneficiaries. Special areas of focus may be reducing expenses, increasing auction proceeds and improving check in and check out procedures. The club became a sponsor of the city's annual Spaghetti Supper, a fund raiser to help support programs and operations of the Encinitas Senior Center. Several members participated by manning tables explaining the club's general purpose and the Rotary Home Team in particular. Other members served wine throughout the event. What an enjoyable and worthy cause!! Since 2010 one of the most frequent programs of the Encinitas Rotary is its weekly senior dance party. Every Wednesday from 12:45 pm to 3:15 pm, 52 weeks a year the Encinitas Rotary runs a senior dance at the Encinitas Senior Center (Encinitas Community & Senior Center). The turnout each week is 70 to 85 seniors. It is not unusual to have over 6 seniors above the age of 90, with the average age in the low eighties. Food is served each week with food donations; as of May 2018 donors included Jimbo's, Lazy Acres, Peet's Coffee, and Yummy cupcakes. A nominal fee of $4.00 is charged each week. Special parties are thrown around the holidays (New Years, Valentine’s Day, July 4th, Halloween, Thanksgiving, Veterans' day and a holiday party at the end of the year). Recently, the July 4th party had 102 seniors and the New Year’s Party had 150 people attend and over 17 Rotarian volunteers. This weekly dance greatly improves the life of so many seniors each week, providing exercise for the body and the mind and gives the seniors a great reason to get dressed up and out of their houses. It is the highlight of the week for many of these seniors, with social interaction providing a safe activity fulfilling the need to touch and be touched. Rotary does make a big difference in the lives of these seniors. *Turn right onto Balour Dr go 0.1 mi. *Turn left onto Oakcrest Park Dr and go 354 feet and turn left into the Senior/Community Center. Need more info? Please contact Marty Cooper at 760-632-0057 and visit the ballroom dance website http://www.seniorballroomdance.com . 31-Jan-2011 After more than 25 years of hard work, Rotary and its partners are now "This Close" to eradicating polio, and a wide array of public figures and celebrities have signed on to help Rotary spread the word. Headlined by Microsoft Corp. Chairman Bill Gates, this diverse lineup of influential leaders and personalities includes Archbishop Emeritus Desmond Tutu, action movie star Jackie Chan, conservationist Jane Goodall, premier violinist Itzhak Perlman, Grammy Award winners A.R. Rahman, Angelique Kidjo and Ziggy Marley, golfing great Jack Nicklaus, and peace advocate Queen Noor of Jordan. In a series of print, broadcast and outdoor public service advertisements each uses a simple hand gesture to show Rotary is "This Close" to wiping out polio worldwide. Nicklaus, Perlman and Tutu are themselves survivors of this crippling disease. Broadcast television commercials feature a mix of celebrities and non-celebrities around the world saying, "We are this close to making history. We are this close to changing the world. We are this close to ending polio—all we need is you." To view or download the materials in high quality, please click on the related media below.